Carlton Fisk's team, the Charlestown Forts had a record 25-0 season! In the final game of the year, Carlton Fisk scored 17 points to lead his team in a 55-41 win over Winooski High School (of Winooski, Vermont). 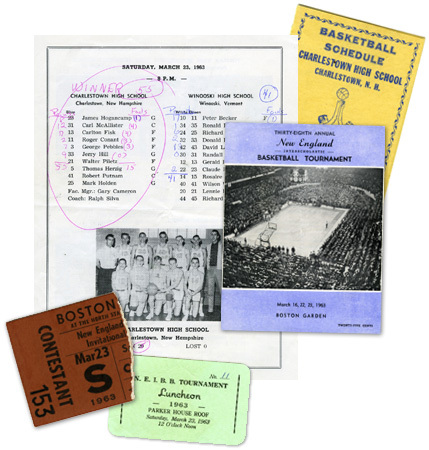 In what has been described as one of the most incredible performances ever by a high school player at Boston Garden, Pudge Fisk took over the game in the second half. Charlestown beat Winooski, Vermont, and its highly touted center Dave Lapointe 55-41 in the New England tournament before 12,000 screaming fans. This attendance was four times more than the entire population of Charlestown, NH! "Carlton just had a monster game that night," Forts' Coach Ralph Silva said. "Anyone who ever saw that game knew he was something special."